Though Dr. Pulsipher can enhance a smile at any age, beginning treatment of orthodontic problems between the ages of 7 and 10 can bring about the best result and the least amount of time and expense. At this early age, orthodontic treatment may not be necessary, but vigilant examination can anticipate the most advantageous time to begin treatment. Orthodontics at age 8 can be too late for some children because the jaws are mostly grown by age 6—about 80% grown. Some problems with your child’s bite are easier to correct if they are found and treated early. For example, when necessary through the use of orthodontics, Dr. Pulsipher is able to make space for all the teeth to fit in cases where the patient’s jaw is too small. Your jaw is growing fast when you are 8. If you wait until you are 12, the orthodontist needs to push a lot harder to expand your jaw so it hurts. By time you are 20, you may need surgery to expand your jaw. We recommend that all children get a complimentary consultation with Dr. Pulsipher before age 7. While teeth may appear straight, there could be a condition that only an orthodontist would detect. Early treatment may prevent more serious problems from developing or may make treatment at a later age (when appropriate) shorter and less complicated. Around age 7 is when the first molars and incisors usually erupt, establishing the bite. During this time, Dr. Pulsipher will assess the relationships between the teeth. 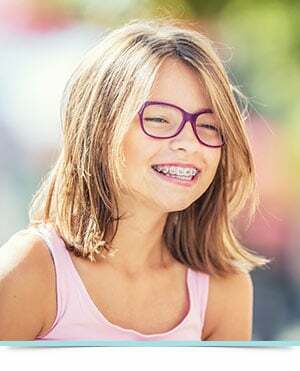 Up to 16 new permanent teeth will have erupted between the ages of 10 to 12 years, at which time Dr. Pulsipher will recommend a second evaluation for comprehensive orthodontic treatment of the adolescent dentition.